I actually placed this in my calendar (hehe) that yesterday marks the 10th year since One Tree Hill first aired their pilot episode! I can't help but go senti over a TV series, timing din kasi na shinow sya during my emo-kid years. 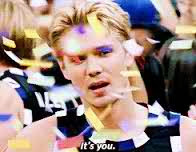 OTH na siguro ang series with the best soundtrack (that introduced me to Dashboard Confessional, Fall Out Boy, Jack's Mannequin, etc), and can-relate characters (na tumatak even minor characters like Mouth, Jimmy Edwards, and Coach Whitey (with his quote permanently placed here in my blog's footer!)). I have to admit, sabi ko I wasn't really a Peyton fan before. Masyado shang emo and madrama, I picked Brooke Davis for Lucas (Broocas!) --the bubbly, typical cheerleader, charming, fashionable, entrepreneurial (Clothes Over Bros! ), and school council president of the 2 "mag-bffs". Pete Wentz of the Fall Out Boy visited One Tree Hill to perform in Tric! Peyton's psycho "brother", turned stalker pala! "At this moment there are 6,470,818,671 people in the world. Some are running scared. Some are coming home. Some tell lies to make it through the day. Others are just not facing the truth. Some are evil men, at war with good. And some are good, struggling with evil. Six billion people in the world, six billion souls. And sometimes... all you need is one." I can totally relate to this post!!! Good one Ana! Cheers to this one! "OTH na siguro ang series with the best soundtrack (that introduced me to Dashboard Confessional, Fall Out Boy, Jack's Mannequin, etc), and can-relate characters (na tumatak even minor characters like Mouth, Jimmy Edwards, and Coach Whitey.." -- OMG GIRL. My thoughts exactly! I love the soundtrack the most!